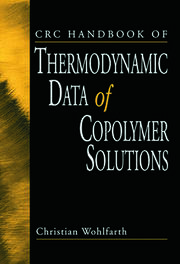 The CRC Handbook of Thermodynamic Data of Aqueous Polymer Solutions provides a new and complete collection of the practical thermodynamic data required by researchers and engineers for a variety of applications including: basic and applied chemistry; chemical engineering; thermodynamic research; computational modeling; membrane science and technology; and environmental and green chemistry. This book details such advanced applications as the separation of complex biochemical mixtures and the purification of proteins in aqueous two-phase systems. 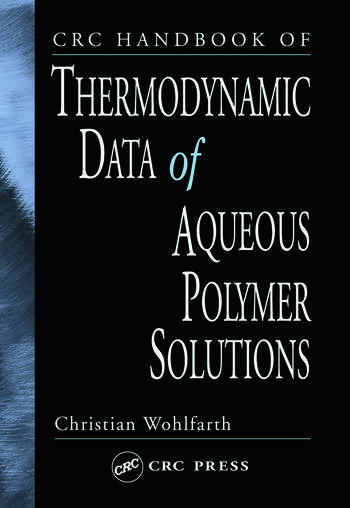 An advantage of The CRC Handbook of Thermodynamic Data of Aqueous Polymer Solutions is that the data is compiled into one comprehensive source. The data - which includes such developments as vapor-liquid and liquid-liquid equilibria, low-and high-pressure equilibrium data, enthalpic and volumetric data, and second virial coefficients - is necessary in studying intermolecular interactions, gaining insights into the molecular nature of mixtures, and providing the necessary basis for any developments of theoretical thermodynamic models. "...Represents a comprehensive survey of all relevant data in journals and theses… ...An indispensable source of information for the researchers involved with water-soluble polymers." 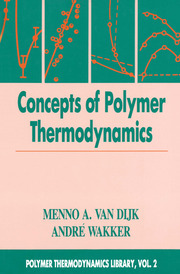 "[This book] provides a new and complete collection of the practical thermodynamic data required by researchers and engineers for a variety of applications… An advantage of [this book] is that the data is compiled into one comprehensive source. The data…is necessary in studying intermolecular interactions, gaining insights into the molecular nature of mixtures, and providing the necessary basis for any developments of theoretical thermodynamic models."